Quality Management Isn't a Risky Business | KLH Industries Inc. There's a framed 8.5" by 11" piece of paper hanging on the lobby wall at KLH Industries. Inside the frame and just above the signature reads the words, "Certificate of Registration: AS9100 Revision B and ISO 9001:2008." 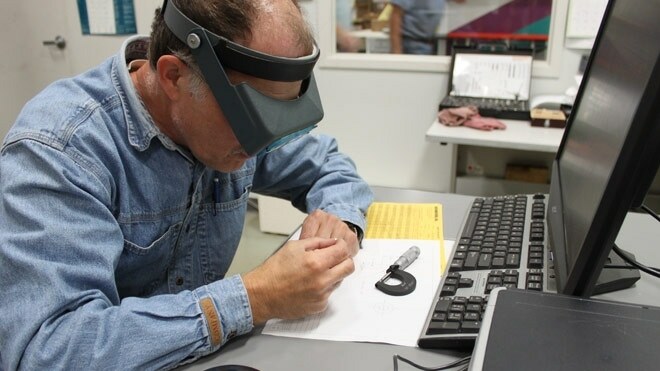 The skeptics, who are fearful of the extra documentation and overhead costs of a quality management system, will say that a piece of paper doesn't make quality parts. The skeptics are right...and wrong. A quality certificate won't roll up into a magic wand, work overtime or improve lead times. Instead, a quality management system (QMS) will establish criteria to manage the flow of information and processes. Ask any company with a certification hanging on the wall; a QMS forces them to set quality objectives, meet them, and exceed them. A more meaningful evaluator of a quality system is the level of maturity - how long it's been in existence and how it's developed over time. Unless something goes wrong with that part, a customer wouldn't know the difference between a lazy ISO shop and a diligent one until it's too late. KLH, for example, has been ISO-certified since March 2000, and AS9100 certified since August 2010. Each year, a team of internal auditors conducts a full system audit, combing through every line of the ISO/AS9100 standard and every syllable of KLH procedures. "First step is making sure our procedures satisfy the standard. Next step is making sure we follow our procedures," describes one KLH internal auditor, who was sorting through a purchasing procedure. Inherently, all this auditing and paperwork adds an overhead cost that a "mom and pop" shop won't have. These shops are advantageous for companies living in a low price environment, but not for companies interested in risk management. "Cutting corners is the easy way out, it's lazy," says Operations Manager & Internal Auditor Joe Mingari. "Every quality standard I've read is proactive about preventing these types of gaps and errors. When I'm sending parts out to our vendors, I look for quality certifications. Otherwise, is it worth the risk?" When lives are on the line, the answer is simple - no. Movers and shakers of the aerospace industry have required AS9100 certification for nearly a decade (NASA since 2002). In the world of risk management, quality management systems play a big role in developing trust. A mature quality management system is yet another tool in KLH's toolbox. An AS9100 and ISO 9001 certificate may just hang on the walls, but as a foundation for manufacturing at KLH, it might as well be the wall itself.